Food allows us to travel anywhere in the world, without leaving home. Books do the same thing, but in a different way. Books whisk us off on cerebral journeys. When I read Alexander McCall’s Smith’s No.1 Ladies Detective Agency novels, I roam Bostswana, as the traditionally built Precious Ramotswe. 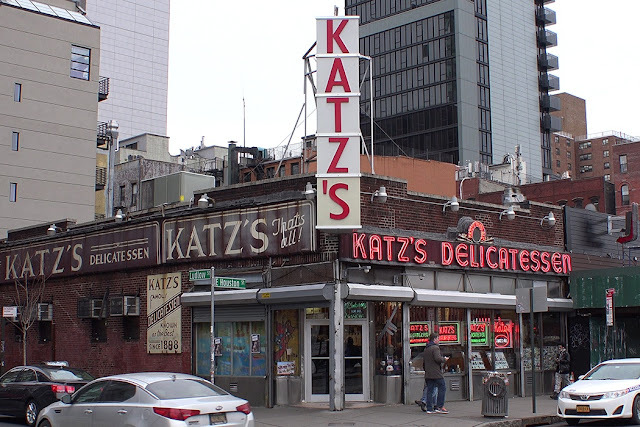 When I eat pastrami on rye, dripping with sauerkraut and thousand island dressing, I am transported to New York’s Katz's Deli, my thigh blissfully pressed into JJ's thigh; the cheesecake for dessert, sitting tantalizingly on the table between us. It took a move to America’s east coast, and JJ, for me to fully appreciate what honest-to-goodness pastrami on rye tastes like. It's a sybaritic sandwich. 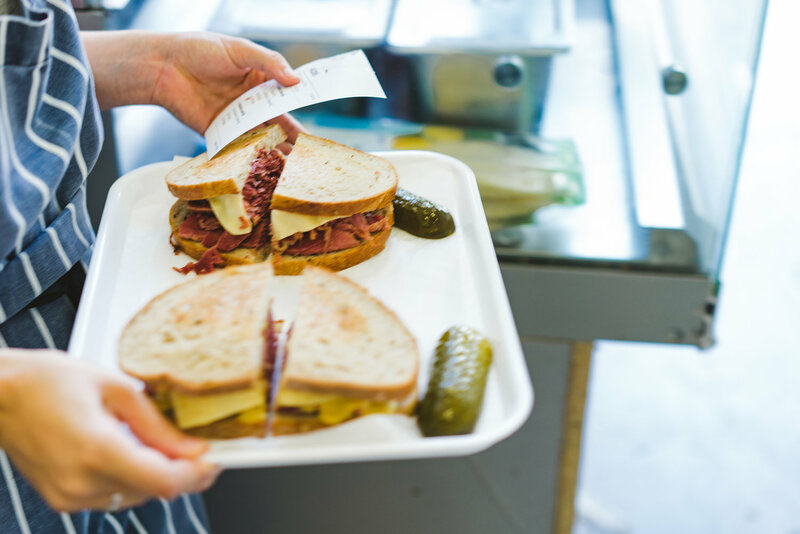 The slightly rough, peppery pastrami; the silky, salty sauerkraut; and the dense, herby rye bread, create a flavour combination that is Theatre-For-The-Tongue. You can’t get an authentic pastrami on rye in San Francisco, or London - but you can come close creating it at home. This is what Katz's Deli Pastrami looks like. This is not available in Britain. It probably goes without saying, but I'll say it anyway, this is not a budget sandwich. You want to use the best ingredients you can find. Ideally, buy everything from a popular Jewish deli. If that's not an option, get your rye bread, sauerkraut and beef pastrami from a local market that offers specialty foods. I buy my ingredients in the UK from Ocado or Waitrose. Good Jewish Rye Bread, along with Pastrami is actually impossible to buy in Britain, but you can get pretty good options here. The Celtic Bakers does a nice Organic Rye Sourdough (Ocado and Waitrose) and Waitrose's own "Wheat and Rye Sourdough" (pre-sliced) is acceptable. Costa and Mollica's Farina Wholeblend Toasting Bread also works. Naturally, you can make your own rye bread which is what I often do. You're looking for a super-sturdy bread here, as it's got to hold up to the dressing, kraut and meat. Speaking of meat, Waitrose's own British Pastrami is perfectly acceptable. You can make your own pastrami from a nice fatty piece of brisket and though I have yet to give it a go, it does seem worth the effort. * To make this into a Sybaritic Reuben Sandwich, add a slice of Emmi Raclette Cheese while grilling the bread. Be sure to allow it to melt. If you can't find Raclette, any good Swiss Cheese will work, sliced Gruyere or Emmental are both very good. 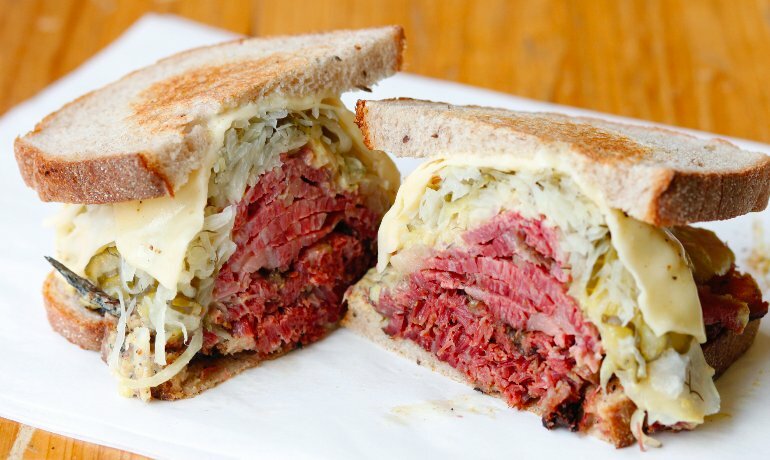 And yes, Reubens are often made with corned beef, but pastrami is tastier. Whip up your Thousand Island Dressing first. This makes a flavourful spread for many sandwiches and burgers, but especially Pastrami on Rye and Reubens. It’s not bad on salads either, especially the diner variety made with iceberg lettuce. Combine 250ml 1-cup Hellman's Real Mayonnaise with 250ml 1-cup Heinz Tomato Ketchup. Add 3 large Hengstenberg Knax Crunchy Gherkins, shredded, or about 200g 2/3-cup of Felix Bostongurka Pickled Cucumber Relish. Stir in a teaspoon of Coarse Black Pepper. Keeps in airtight jar in fridge for a couple of weeks. Next, heat butter in large skillet, over low heat. Add bread and slowly grill on both sides until golden brown. Remove bread and set aside. Heat sauerkraut in same skillet. Stirring often until heated. While kraut heats up, slather thousand island dressing on bread with a rubber spatula. Pile on the kraut and pastrami. Slice sandwich in half. It’s a true test of love if you can share. JJ reminds me that combining butter with meat is not Kosher. For Kosher feasting, replace butter with walnut oil. 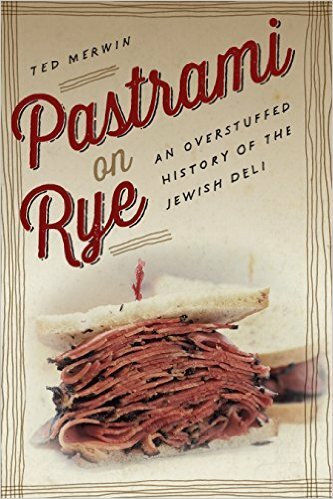 He also notes New York's famous Jewish delis don't actually make a pastrami on rye or Ruben like this. He's right - but this is how to get THAT Jewish Deli taste at home. Crunchy Gherkins and Sea Salt and Black Peppercorn Kettle Chips. Also good with potato salad or cold slaw, though I prefer chips. Seltzer, New York Egg Cream Soda (seltzer, chocolate or vanilla syrup and milk) Dr Brown’s Cherry Soda, Boylan Natural Root Beer, Boylan Black Cherry Soda, Coco-Cola in those little glass bottles. “The deli was a place where they could eat with their hands, talk with their mouths full, fill their bellies and enjoy the pleasure of each other’s company in a raucous and convivial setting.” In other words: You want uncouth? I’ll show you uncouth." The spices rubbed onto beef brisket used for pastrami tell us about this delicacy. Cinnamon, paprika, allspice, and hot pepper show the influence of the Turks who had ruled southeastern Europe, where pastrami seems to have originated in Romania, Bessarabia, and Moldavia. 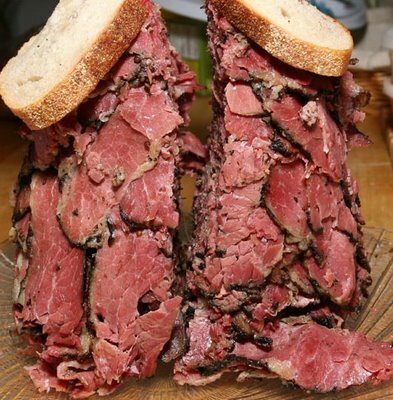 “Pastrami,” was probably coined in America by Yiddish-speakers inspired by the word salami, adapting it from closely related Romanian, Russian, Turkish, and Armenian words.